Time travel via Dinosaur Hall at the Natural History Museum and the ancient La Brea Tar Pits. Film and TV fans can’t miss Universal Studios, Warner Brothers, Paramount Pictures and Sony Pictures. Explore LA with Starline Tours and the infamous TMZ Tour. Universal Studios Hollywood is a must-see Los Angeles attraction if there are young kids in tow. The park is an easy drive, just a few minutes from downtown or Hollywood. Parking is easy. The CityWalk avenue of themed shopping outside the park is gloriously entertaining. But the theme park is fun for anyone who wants to get a behind-the-scenes view into moviemaking and then hit the thrill rides. The backstage tour changes day to day, depending on what is being filmed and available for show. And patrons always get to see such iconic sets as the Psycho house, the Jaws lake and the clock square from Back to the Future. Save on your admission with the Southern California CityPASS. Those who purchase a Hollywood CityPASS get 50% off their ticket purchases for four major Hollywood attractions. The CityPASS included attractions are: Madame Tussauds Hollywood, Hollywood Behind-the-Scenes Tour, Starline Movie Stars’ Homes Tour, and your choice of Dolby Theatre Guided Tour or The Hollywood Museum. Madame Tussauds Hollywood, the renowned wax museum at 6933 Hollywood Boulevard (866-841-3315) is located next to the famous Grauman’s Chinese Theatre. Get up close and personal with more than 100 incredible and lifelike wax figures, step onto memorable movie blockbuster sets spread over three floors of attraction space and be sure to bring a camera and take home the ultimate souvenir photo. Madame Tussauds Hollywood is redefining celebrity encounters. Who do you want to meet? Don’t miss out on the Hollywood Behind-the-Scenes Tour at 6708 Hollywood Boulevard (323- 402-1074). Hollywood Revealed! Expert guides expose what other tours miss. Visit the movie palaces that host the most star-studded Hollywood movie premieres today. Place your hands and feet onto your favorite celebrity’s cement prints at the legendary Chinese Theatre. Let us help you find your favorite celebrity on the Walk of Fame, as we walk to the perfect spot for viewing the Hollywood sign. Follow the pathway of the stars (Awards Walk) to the Dolby Theatre, home of the Academy Awards (the Oscars)! Visit filming locations. We change Hollywood from the ordinary to the extraordinary! Let Starline Tours 6925 Hollywood Boulevard (800-959-3131) take you where the stars live, shop, hang out and play in famous Beverly Hills, Bel Air, Holmby Hills and Hollywood Hills. See over 40 celebrity homes from an air-conditioned or “convertible” mini-bus. See the mansions of today’s superstars and Hollywood legends, as well as the Hollywood sign and sights on Sunset Strip and Rodeo Drive. Tours depart daily from Grauman’s Chinese Theatre. The Dolby Theatre Guided Tour 6801 Hollywood Boulevard #180 (323-308-6300) is where it’s your turn to step beyond the red carpet…and explore the world famous home of the Academy Awards® Ceremonies and host of Hollywood’s most glamorous events. See 10,000 real showbiz treasures at the Hollywood Museum 1660 North Highland Avenue (323-464-7776)! Your favorite stars + 100 years of Hollywood! Marilyn Monroe, Elvis, I Love Lucy, Superman, Star Trek, Planet of the Apes, Glee, High School Musical, Sopranos, Rocky, star cars, DiCaprio, Clooney, J Lo, Brangelina & more. Vintage photo gallery. Hannibal Lecter’s jail cell. Max Factor’s world-famous makeup rooms where Marilyn Monroe became a blonde & Lucille Ball a redhead. Visit Hollywood’s largest collection of costumes, props, posters & photos! 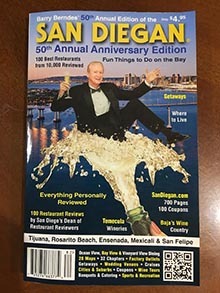 Southern California CityPASS is a booklet of admission tickets to Southern California’s top attractions, including some in San Diego. A must-see attraction is the San Diego Zoo, which celebrates its 94th birthday this year. This 100-acre San Diego Zoo is an international animal experience where guests can see some of the earth’s rarest wild life including giant pandas from China, tree kangaroos from New Guinea and river hippos from Africa. The San Diego Zoo is home to more than 4,000 animals, representing 800 species, making up a diverse collection of animals many of which are rarely seen at other zoos. 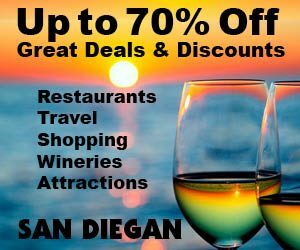 North County’s most visited attraction is the San Diego Zoo Safari Park. This 1,800-acre park is home to more than 3,500 animals, representing 260 species. In the fall, the park is open daily 9 a.m.–6 p.m. In winter, the park opens daily at 9 a.m. and closes at 5 p.m. In the summer, grounds are open 9 a.m.–9 p.m.
SeaWorld is set on 189 beautifully landscaped acres along the shores of beautiful Mission Bay Park a 4,600 acre aquatic wonderland, of which SeaWorld is the center piece. This fun filled adventure park features thousands of fascinating mammals including Shamu colorful fishes, reptiles and birds including manatees at Manatee Rescue. Plus, they have polar bears, beluga whales, arctic foxes and walruses at Wild Arctic.